Parents have to pick their battles with their kids. 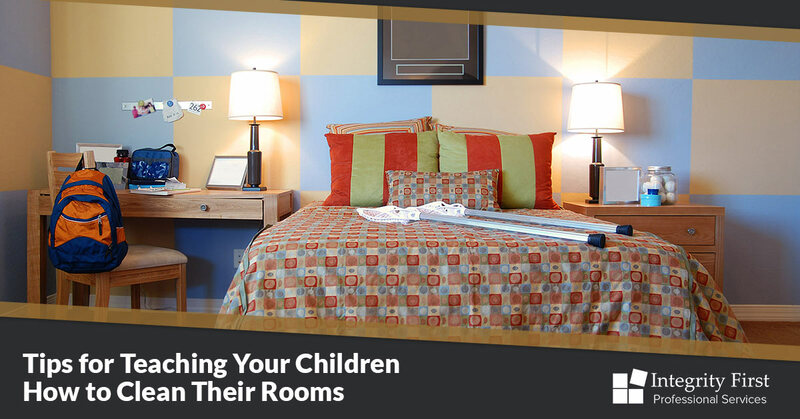 One battle that can cause major headaches is your kids’ rooms. You don’t want to do it for them the entire time they abode with you. So what’s the solution? Integrity First Professional Services, a commercial and residential cleaning service company in the Greensboro area, understands the frustrations parents face when trying to get their children to clean their rooms. Here are some tips for parents to help your kids do just that. Help them out. For many kids, especially those on the younger side, they just don’t know how to clean their rooms. They don’t know where to begin. Often, they feel overwhelmed with the task. Here is your chance to show them how as well. Verbalize as you are helping your children clean. Saying things such as, “Let’s start with collecting all the trash in your room and then we’ll pick up the dirty laundry,” helps to ingrain in your child the tasks that need to be complete, so the next time around, they will remember. Make the tasks age-appropriate. Yes, your teenager should be able to clean their entire rooms all by themselves. However, your toddler probably can’t — at least in one session. But, odds are, your toddler can make his or her own bed. Set your expectations to the age, which will minimize stress for you and your child. Make a checklist. Just like your children might not know where to start, they also may not be able to remember every little task, such as taking the trash out after picking it up. A chart is a great visual reminder of what needs to be done. Make a reward chart. This is recommended for all household tasks, but it’s amazing what kids will do for stars and stickers (teachers know this secret!). A rewards chart is great because the reward is immediate (whatever it is for that day), but it also builds confidence as the chart shows how many times they’ve completed the task over the month. A great all-around tool for self-esteem. Make cleaning a game. If your child is competitive, set a timer and have him or her beat the clock. If your child is imaginative, have the trash basket be a dragon that your child feeds every time trash is put up. There are an infinite number of games you can play that can help pass the time and make cleaning fun! First Integrity Professional Services in Greensboro offers a variety of cleaning services, such as residential, commercial, and office spaces. We are an eco-friendly cleaner, using only green products that avoid the use of toxic and volatile compounds that can be harmful to our environment. We do one-time cleans, such as move-ins and move-outs, as well as monthly services. We believe in doing the right thing, and our goal is to exceed your expectations and offer the best cleaning services. Contact us today for a free quote!